Get supple, hydrated skin with our superb formula of LIPIDURE®*1, which has high moisturizing ability, and ceramide*2 which works as skin's natural barrier, along with our patented Super Amino Acid Complex*3 and botanical milk cream ingredients*4, to deliver essential nutrients to give you soft skin. Choose from MOIST for hydrated, supple skin, and LIGHT for a smooth finish. 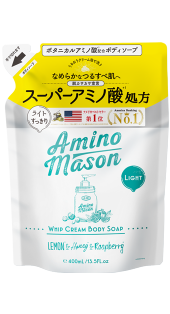 Amino acid based surfactant*5 formula to create hydrated, supple skin. Shea butter*6, avocado*7, cherimoya*8, milk derived ingredients*9 and Manuka honey*10 are blended for superb hydration and nutrients necessary for supple skin. 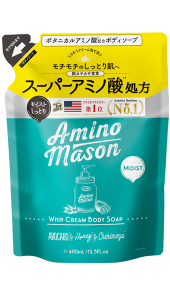 Amino acid based surfactant*5 formula to create smooth, hydrated skin. 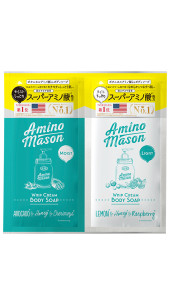 Lemon*11, raspberry*12, bilberry*13, milk derived ingredients*9 and Manuka honey deliver sufficient amount of hydration while leaving a smooth, light finish. Refreshing and feminine scent of Classic Rose Bouquet. 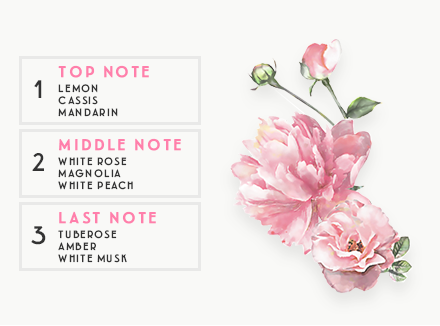 Notes of rose and magnolia with juicy citrus finds a perfect balance that stays with you. Copyright © Amino mason All Rights Reserved.